is to allow people to get legal help. Contact us and speak with a lawyer or a detective within 8 business hours or less. 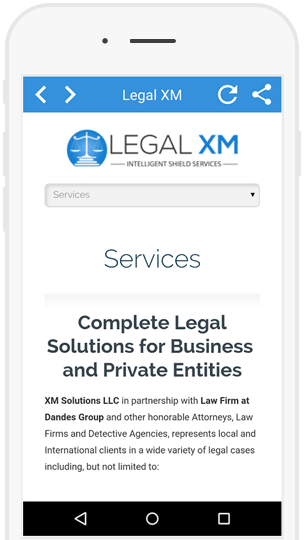 This is the official app of Legal XM Network – A quick and efficient way to get legal help. At the touch of a button, get connected with Leading Law Firms, Attorneys, Detective Agencies or Bail Bonds Companies near you. Our network of dedicated lawyers and detectives works diligently to keep individuals, families and businesses safe. Legal XM is integrating modern technology with the practical application of law in order to better serve you. This application prompts you to answer a few questions. These answers are then transmitted to our office. Once received we then review your case and have an Attorney or a Detective contact you back. All your information will be kept confidential in compliance with all state, federal and International laws. For disclaimer or more details and information please do not hesitate to contact us.